Visit the Memorial Museum of Cosmonautics. Here you’ll have the opportunity to meet a real cosmonaut and learn about the history of space exploration, with original exhibits and models relating to space technology, history and art. It’s a beautiful and out-of-this-world experience that will have you seeing stars. Explore Catherine’s Block and the fountains in the Lower Garden at Peterhof on a guided tour, or be seduced by the sheer extravagance of Peterhof’s Grand Palace, which was modeled on the Palace of Versailles. Alternatively, wander the incomparable Upper and Lower Gardens at Peterhof, including the Palaces’ majestic Fountains. Enjoy a highlight lunch at the old-world wooden ‘Podvorie’ restaurant. Here you’ll be offered traditional Russian cuisine where the delicious fare is actually home-grown at the restaurant owner’s private summer residence. Enjoy the unforgettable views of Geiranger fjord (weather permitting) from Dalsnibba before continuing to travel alongside spectacular mountains to Jostedalsbreen, the largest icefield in continental Europe covering 487 square kilometres. Visit one of the most photographed and impressive arms of the icefield, Briksdalsbreen, and have a truly Norwegian experience. Be taken by ‘trollcar’ up the glacier for a spectacular view of the glacier and magnificent waterfall. Journey up the funicular railway 1,050 feet to Mt. Floien for a spectacular bird’s eye view of the city and fjord. Alternatively, walk the lanes and discover a little of the wonder of this pretty municipality and its surrounds. This morning, tour the wonderful Rosenborg Castle – an elegant Renaissance castle built as a country summerhouse in 1606. You’ll also get to see the delightful courtyard of Amalienborg Palace, home to Princess Mary and the Danish Royal Family. Take an iconic cruise through the city canals, or visit the Christianshavn District of Copenhagen, including a tour of the Church of Our Saviour. 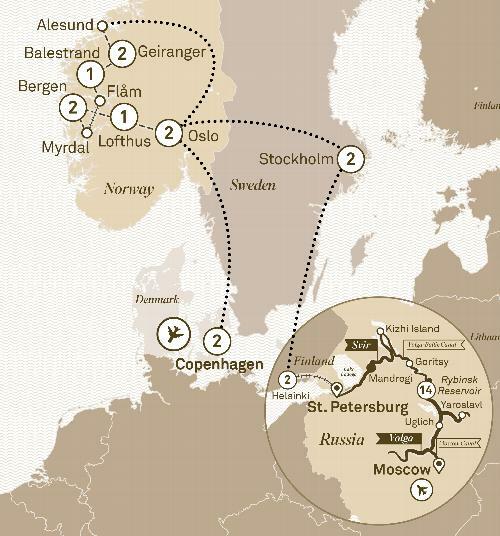 Cruise the Volga river on board Scenic Tsar between Moscow and St Petersburg before exploring Scandinavia on a 29 day adventure from Moscow to Copenhagen.